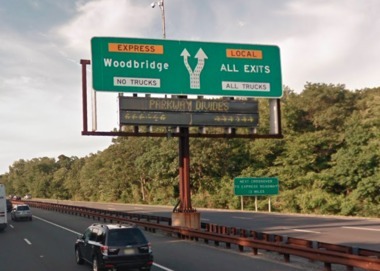 Traffic might is expected to be a mess on the Garden State Parkway through part of Monmouth County starting Friday and through the weekend as two northbound local lanes will be closed for repairs. The lanes will be closed starting at 10 a.m. Friday at milepost 112.4 in Middletown as workers fix the bridge that carries the Parkway over Middletown-Lincroft Road, officials said. The traffic delays could be “severe,” according to the New Jersey Turnpike Authority, which operates the Parkway. The closure lasts until 5 a.m. Monday between exits 109 and 114. A back hoe being hauled on a flatbed trailer struck the bridge in November as it traveled along Middletown-Lincroft Road. One Parkway lane had to be closed for two days while emergency repairs were made to the bridge. Workers installed temporary steel beams until a permanent fix could be implemented. Motorists can call 511 from a hands-free mobile device or download the SafeTripNJ smartphone app to check on traffic conditions over the weekend. Middletown-Lincroft Road will also be closed in the area of the Parkway from 4 p.m. Friday until 5 a.m. Monday, according to Middletown police.